HOUSTON, Texas - NOAA's National Hurricane Center issued a Public Advisory at 10 p.m. Central Daylight Time on Wednesday, August 30, 2017, due to Tropical Depression Harvey which continues to produce record-breaking rainfall. Tropical Depression Harvey has maximum sustained winds of 35 mph (55 km/h), with higher gusts. Gradual weakening is forecast during the next 48 hours as Harvey moves farther inland. 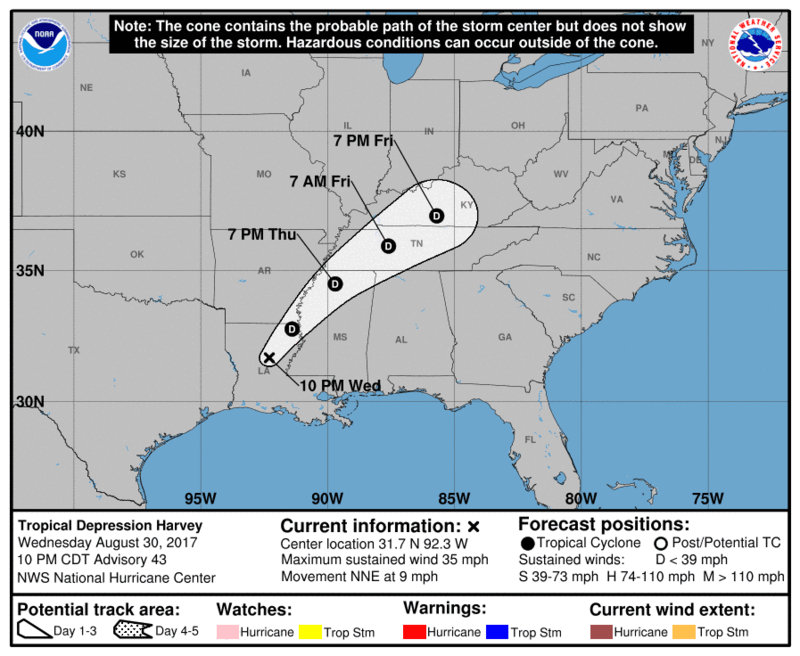 Tropical Depression Harvey is located 30 miles north-northeast of Alexandria, Louisiana and is moving to the north-northeast at 9 mph (15 km/h). NHC forecasters say that Harvey is expected to continue north-northeasterly through tonight. A turn toward the northeast is expected Thursday night and Friday. 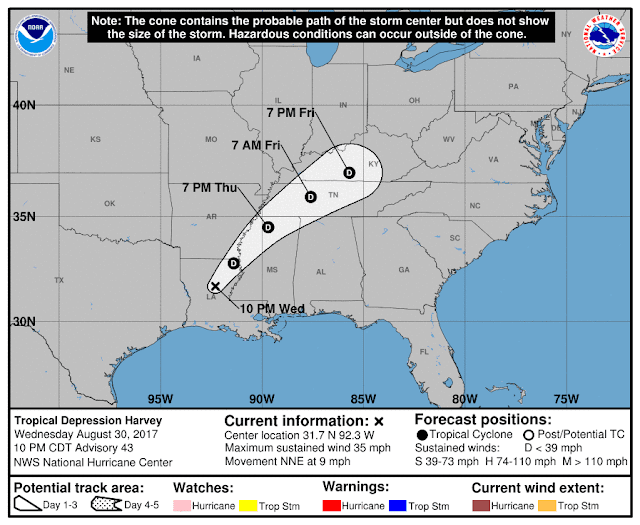 On the forecast track, the center of Harvey should move through central Louisiana tonight, then move through northeastern Louisiana and northwestern Mississippi Thursday and Thursday night, and over the Tennessee Valley region on Friday. 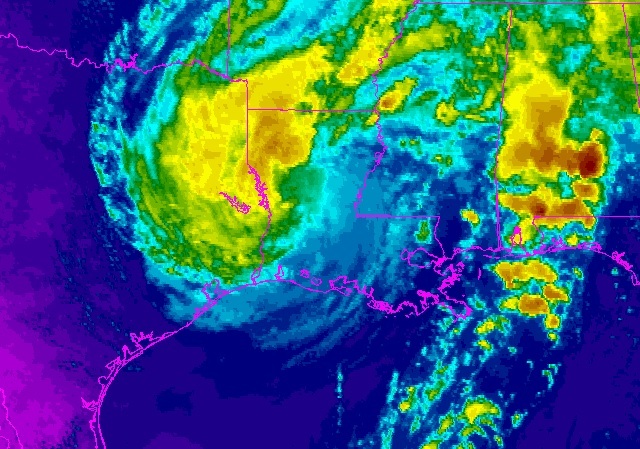 RAINFALL: Harvey is expected to produce additional rainfall accumulations of 4 to 8 inches from southwestern Louisiana and the adjacent border of eastern Texas northeastward into western Tennessee and Kentucky through Friday with isolated amounts up to 12 inches. The threat of heavy rains has ended in the Houston/Galveston area. However, catastrophic and life threatening flooding will continue in and around Houston, Beaumont/Port Arthur, eastward into southwest Louisiana for the rest of the week. The expected heavy rains spreading northeastward from Louisiana into western Kentucky may also lead to flash flooding and increased river and small stream flooding. Elsewhere, the outer bands of Harvey are expected to produce additional rainfall amounts of 3 to 6 inches over portions of the central and eastern Gulf States and 2 to 4 inches farther north into parts of the Tennessee Valley, Ohio Valley and southern Mid Atlantic through Saturday. STORM SURGE: Water levels along the northwestern and northern Gulf coast should subside very slowly over the next day or two. TORNADOES: A few tornadoes are possible through this evening across parts of Louisiana, Mississippi, western Alabama, and southeast Arkansas. Additional tornadoes are possible on Thursday afternoon and evening across northern portions of Mississippi, Alabama, and Georgia into parts of Tennessee.